Jikai Dainin Katagiri (片桐 大忍, Katagiri Dainin, January 19, 1928 – March 1, 1990), also known as Hojo-san Katagiri, was a Sōtō Zen roshi and the founding abbot of Minnesota Zen Meditation Center in Minneapolis, Minnesota, where he served from 1972 until his death from cancer in 1990. Before becoming first abbot of the Minnesota Zen Meditation Center, Katagiri had worked at the Zenshuji Soto Zen Mission in Los Angeles and had also been of great service to Shunryu Suzuki at the San Francisco Zen Center, particularly from 1969 until Suzuki's death in 1971. Katagiri was important in helping bring Zen Buddhism from Japan to the United States during its formative years—especially to the American Midwest. He is also the credited author of several books compiled from his talks, the two most prominent being Returning to Silence: Zen Practice in Daily Life (1988) and You Have to Say Something: Manifesting Zen Insight (1998). 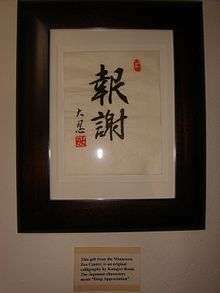 Hanging at the San Francisco Zen Center is this calligraphy piece by Minnesota Zen Center which means "Deep Appreciation". Dainin Katagiri was born in Osaka, Japan on January 19, 1928. He was ordained a monk by Daicho Hayashi at Taizo-in in Fukui, and went on to study under Eko Hashimoto at Eiheiji for three years. After Eiheiji Katagiri enrolled at Komazawa University—the renowned Sōtō institution in Tokyo, Japan—majoring in Buddhist studies. In 1963 Katagiri was sent by the Soto Headquarters Office in Japan to Los Angeles, California to serve as a priest at the Zenshuji Soto Zen Mission. In 1965 he was sent to the Sokoji Soto Zen Mission in San Francisco, California to assist Shunryu Suzuki and later helped out the San Francisco Zen Center (SFZC), which had shared the same building as Sokoji until 1969; Katagiri was of great help to Shunryu Suzuki, especially from 1969 onward. During his years in San Francisco, Katagiri sometimes toyed with the idea of opening up his own Zen community nearby. So, not long before Suzuki's death, he did open a zendo in his home in Monterey, California. In 1972 Katagiri relocated to Minneapolis, near Lake Calhoun. There he became abbot of a small group without a leader, which became known as the Minnesota Zen Meditation Center (Ganshoji). There he also founded Hokyoji Zen Practice Community (Catching the Moon Zen Mountain Center), a country retreat temple in southeast Minnesota. A factor in deciding to go to Minnesota had been the fact that few, if any, Buddhist teachers were located there. Katagiri understood that the majority of teachers at this time were either in New York or California, with much of the country in-between left in need of teachers. During the 1970s and 1980s Katagiri sent over many of his Western students to train at Zuio-ji in Japan, where Narasaki Ikko roshi was abbot. In 1984, in the wake of the Zentatsu Richard Baker controversy resulting in Baker's resignation as abbot of San Francisco Zen Center, Katagiri came at the request of SFZC and served as abbot there on an interim basis until 1985 (returning to Minnesota afterward). He remained there for the remainder of his life, succumbing finally to cancer on March 1, 1990; he left behind thirteen Dharma heirs. Katagiri was married to Tomoe Katagiri, and the couple had two sons together (Yasuhiko and Ejyo). They married in 1960. Soto priest and former student of Katagiri-Roshi, Zuiko Redding, has stated, "My basic memory of Katagiri is of how he paid total attention to what was in front of him. He took care of each thing as if it were the most important thing in the world, whether it was throwing away some trash or talking to another person. He really listened and tried to give the best answer he knew how to give. He also encouraged each of us to stand up in our own space, following our own wisdom rather than depending on him for answers or affirmation. I would sometimes tell him exactly what I thought about some idea he had, only to turn and see him smiling broadly at me, glad that I wasn’t buying into his agenda." Following his death, it was rumored that Katagiri roshi had engaged in sexual relationships with some female students. These rumors have gained a higher profile since one of Katagiri's students, author Natalie Goldberg, wrote about her reaction to these claims. Katagiri, Dainin; Conniff, Yūkō; Hathaway, Willa (1988). Returning to Silence: Zen Practice In daily Life. Shambhala Publications. ISBN 0-87773-431-3. Katagiri, Dainin; Hagen, Steve (1998). You Have to Say Something: Manifesting Zen Insight. Shambhala Publications. ISBN 1-57062-238-8. Katagiri, Dainin (1999). Katagiri Roshi : Buddhist lay ordination lectures: a transcription of the lectures given January 6 to February 4, 1982 at the Minnesota Zen Meditation Center, Minneapolis, Minnesota. Katagiri Roshi Book Project. OCLC 56682716. Katagiri, Dainin; Martin, Andrea (2007). Each Moment is the Universe: Zen and the Way of Being Time. Shambhala Publications. ISBN 1-59030-408-X. ↑ Gach, Gary (1998). What Book!? : Buddha Poems from Beat to Hiphop. Parallax Press. p. 217. ISBN 0-938077-92-9. 1 2 Prebish, Charles S (1999). Luminous Passage: The Practice and Study of Buddhism in America. University of California Press. p. 14. ISBN 0-520-21697-0. ↑ Greiner, Tony (2001). The Minnesota Book of Days: An Almanac of State History. Minnesota Historical Society Press. p. 23. ISBN 0-87351-416-5. ↑ Paprock, John-Brian; Paproack, Teresa Peneguy (2004). Sacred Sites of Minnesota. Big Earth Publishing. p. 36. ISBN 1-931599-26-2. ↑ Snelling, John (1991). The Buddhist Handbook: A Complete Guide to Buddhist Schools, Teaching, Practice and History. Inner Traditions. p. 238. ISBN 0-89281-319-9. 1 2 Chadwick, David. "Interview with Tomoe Katagiri, widow of Dainin Katagiri-roshi". Crooked Cucumber. Retrieved July 30, 2012. 1 2 "Ryumonji Zen Monastery - Teachers". Ryumonji.org. Retrieved 2012-10-13. ↑ Ford, James Ishmael (2006). Zen Master Who? : A Guide to the People and Stories of Zen. Wisdom Publications. pp. 127; 133. ISBN 0-86171-509-8. ↑ "Zuiko Redding Interview". Sweeping Zen. June 17, 2009. Retrieved 2009-06-25. ↑ "Beyond Betrayal". Tricycle: The Buddhist Review. Retrieved May 4, 2013. ↑ "A Letter to Nonin Chowaney from Sojun Diane Martin on Dainin Katagiri". Sweeping Zen. Retrieved May 4, 2013. ↑ Goldberg, Natalie (2005). The Great Failure: My Unexpected Path to Truth. HarperOne. ISBN 9780060816124. ↑ "Leadership". Hokyoji.tripod.com. Retrieved 2012-10-13. ↑ "Our Teacher « Great Tree Zen Temple". Greattreetemple.org. Retrieved 2012-10-13. ↑ "Compassionate Ocean Dharma Center: A Center for Mindful Living". Oceandharma.org. Retrieved 2012-10-13. ↑ "Wild Fox Zen". Wildfoxzen.blogspot.com. Retrieved 2012-10-13. ↑ "Teachers | Norm Randolph". Dharma Field. Retrieved 2012-10-13. ↑ "Minnesota Zen Meditation Center". Mnzencenter.org. Retrieved 2012-10-13. ↑ "The Missouri Zen Center". The Missouri Zen Center. Retrieved 2012-10-13. Fields, Rick (1986). How the Swans Came to the Lake. Shambhala Publications distributed by Random House. ISBN 0-394-74419-5. Storlie, Erik Fraser (1996). Nothing on my mind: Berkeley, LSD, two Zen masters, and a life on the Dharma trail. Shambhala Publications. ISBN 1-57062-183-7. Chadwick, David (1994). Thank you and ok! : An American Zen Failure in Japan. Shambhala Publications. ISBN 0-14-019457-6. "Katagiri Roshi Talks: Minnesota Zen Meditation Center". Apple iTunes Preview.